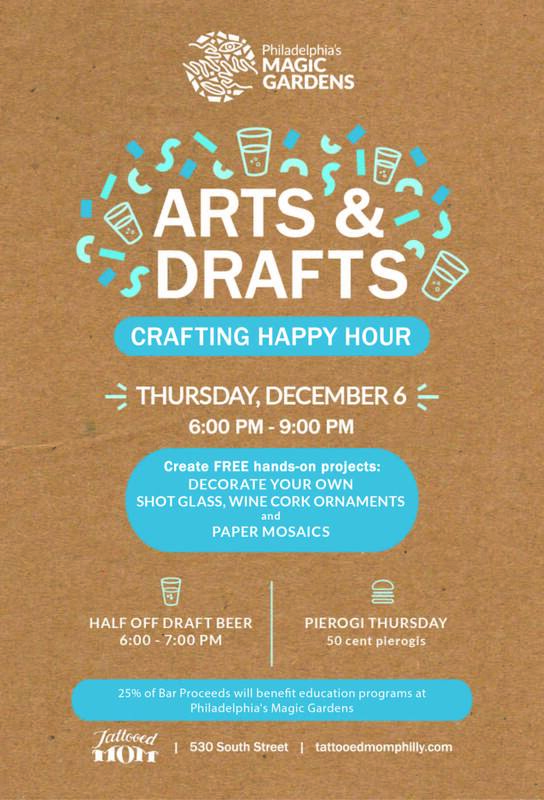 Join our dear friends & neighbors, Philadelphia’s Magic Gardens, for a special Arts & Drafts Crafting Happy Hour! Decorate your own shot glass! Decorate little wooden alebrije animals and make Magic Nuudle sculptures! All crafting materials & goodies will be supplied, so some hungry, come thirsty, and come READY TO CREATE in our downstairs dining room! 25% of all food & drink sales will be donated to Magic Gardens to help support the good work of this neighborhood gem & cultural anchor! 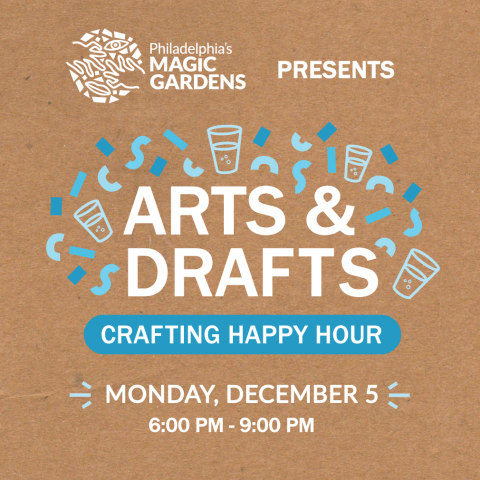 As the holiday season approaches, join our dear friends & neighbors, Philadelphia’s Magic Gardens, for a special Arts & Drafts Crafting Happy Hour! Decorate your own shot glass! Make an intricate paper mosaic! Craft a wine cork ornaments! All crafting materials & goodies will be supplied, so some hungry, come thirsty, and come READY TO CREATE in our downstairs dining room! Check out the event listing on Magic Gardens’ site & learn more about this local cultural gem! 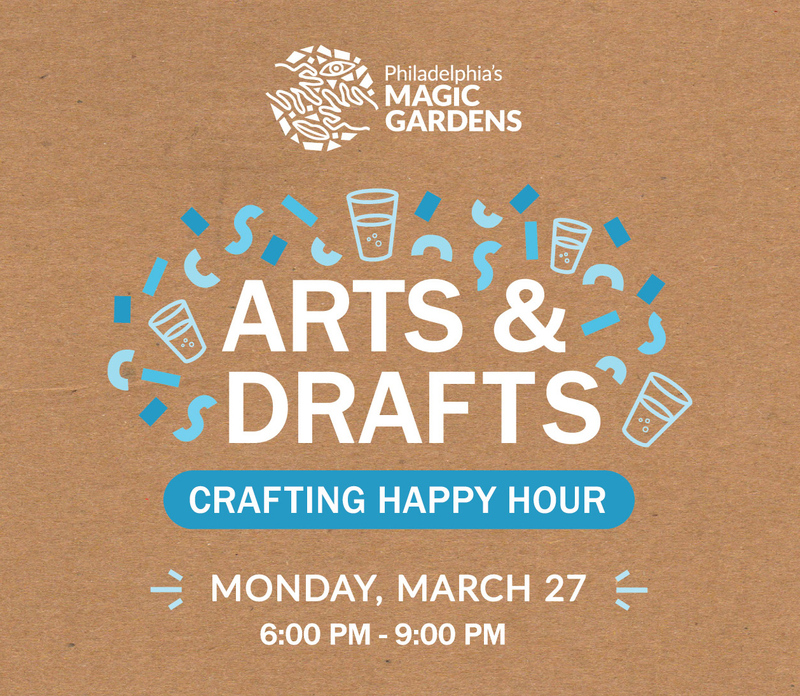 Join our friends from Philadelphia’s Magic Gardens for a special Arts & Drafts crafting happy hour. Make your own scratch art masterpiece and picture frame to show it off in with all the crafting goodies you’ll need supplied. We’ll be donating a percentage of all food and drink sales to help support the good work of this neighborhood gem & cultural anchor. FREE crafts with FREE admission! Beer and crafting, together at last! 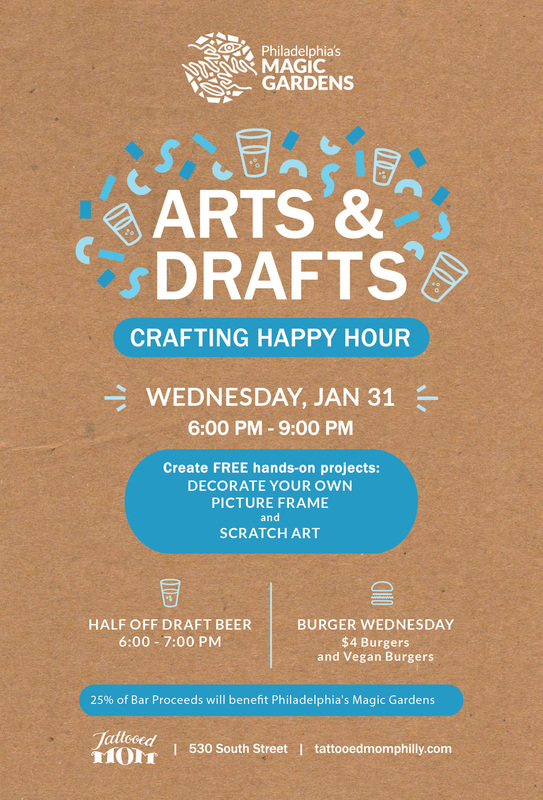 Come eat, drink, and craft the night away with Arts & Drafts! This time they’ll have the supplies to create your own kaleidoscope or make a variety of projects using colorful duct tape. 25% of bar proceeds during the event will benefit Philadelphia’s Magic Gardens. 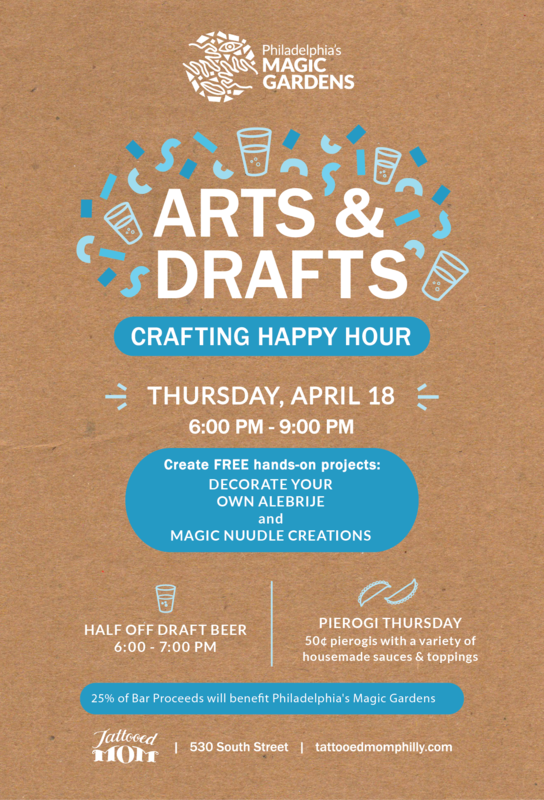 Get crafty, raise a pint, and help us raise funds to support the our friends at the Philadelphia Magic Gardens at a special Arts & Drafts Crafting Happy Hour! Create FREE craft projects, including felt pennants, hand puppets & scratch art. Enjoy half priced drafts from 5:00-7:00 PM, half priced veggie menu till 10:00 PM & a specially created Magic Gardens cocktail. We will be donating 25% of all sales to Philadelphia’s Magic Gardens’ education initiatives, so come out, grab some food, and get your art on!